On January 8, 1935, in Tupelo Mississippi, Gladys Presley gave birth to twins. The first to be born was Jesse Garon, who died shortly after delivery. His brother Elvis Aaron Presley would change the world, but also die too soon. On January 8, 2012, we coincidentally stumbled upon the large crowd and television crews celebrating at his home. Not being the diehard Elvis fans that perhaps we should be – he is the King after all – we didn’t realize until we entered the museum, saw the blue suede cake and blue punch and a couple Elvis impersonators, that today was in fact the King’s 77th birthday bash. We bought tickets and made quick work of the tiny two-room shotgun house. 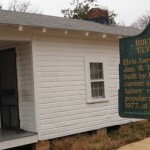 Elvis’ father, after the house was donated, assisted the managing organization in recreating the interior decor, even picking out furniture to make the house as similar to their years in Tupelo as possible. Gladys gave birth to Elvis in the middle of the Great Depression and Mr. Presley had trouble keeping a job and providing for the small family. So by the time Elvis was 13, the family had moved to Memphis in search of greener pastures. Elvis always fondly remembered his childhood in Tupelo, seeing only fun and friends and remembered little of their poverty. There is also a one room museum with memorabilia, clothing, videos and stories from locals about Elvis. The third building is the church Elvis’ family attended. In the church is a video recreation a church sermon, a bit strange to be sure, but… worth a stop at least once. We also popped by Tupelo Hardware which bills itself for legal reasons as “The place Gladys bought her son his first guitar.” Due to trademark worries, the store cannot use Elvis’s name, but they still draw a crowd, offering guitars, t-shirts and postcards for the masses. 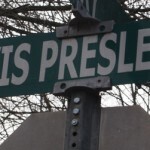 Overall, the town’s a must see for Elvis fans and has one of the best barbeque shacks we’ve had the pleasure of visiting. If you’re there, check out Eli’s on Main despite their “Git Jiggy Wit Da Piggy” slogan, their ribs are fall off the bone perfect.